Hello summer! Er, almost. 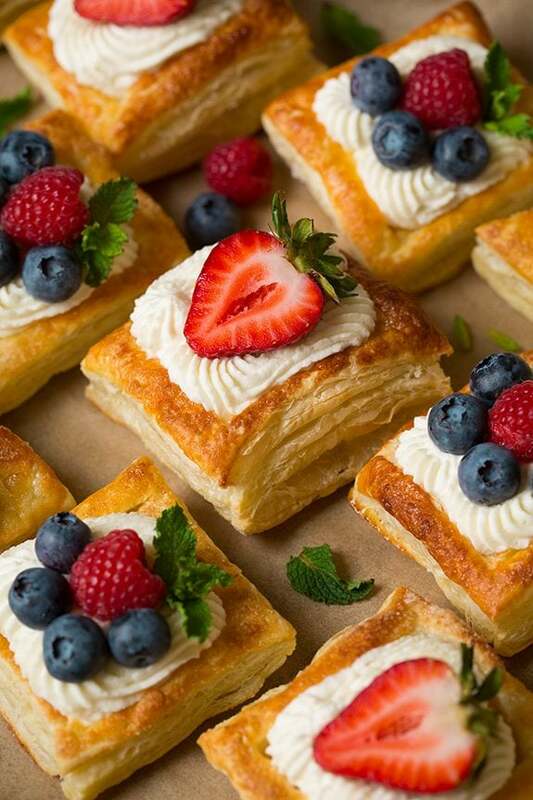 To me it feels like it’s summer outside so I’m just going to go with it and make all the good summery desserts – like these utterly decadent and purely irresistible Puff Pastry Fruit Tarts with Ricotta Cream Filling! 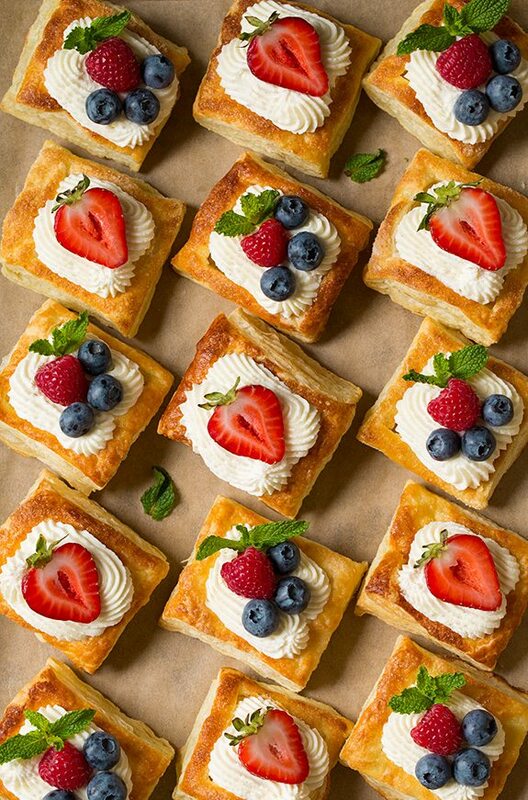 These tarts are so many of my favorite things in one perfect little individual dessert! 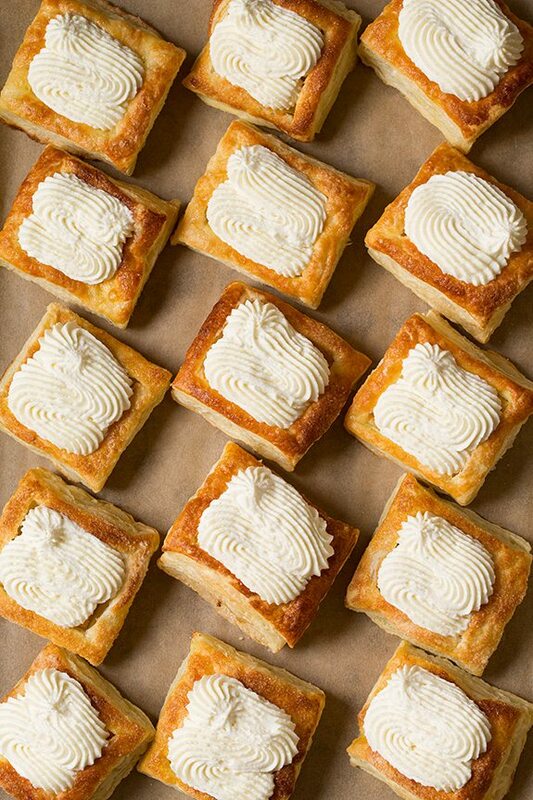 You get a perfectly flaky, perfectly golden, sky-high puff pastry (shhh, no one needs to know we just used store bought. None of us have the hours and hours it takes to make it homemade) and they’re filled with the most luscious ricotta filling (it consists of ricotta, cream cheese, heavy cream and sugar so duh, how could this not be amazing? 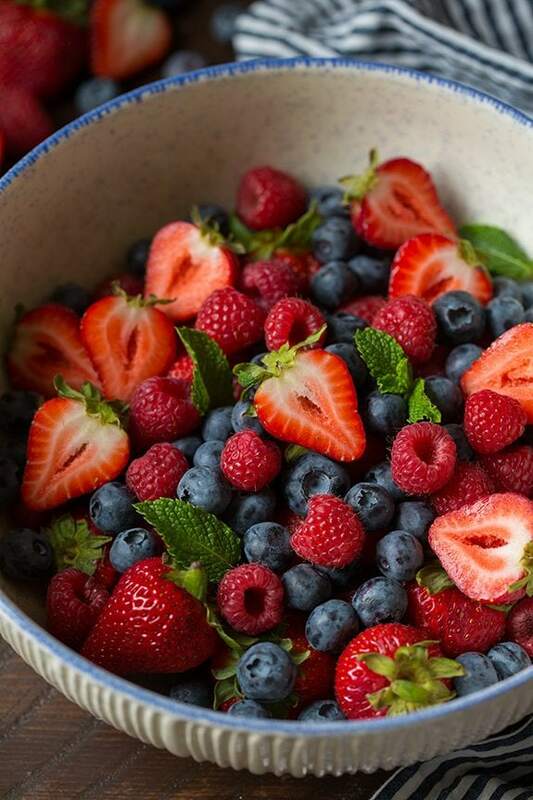 ), and it’s finished with fresh, colorful berries. 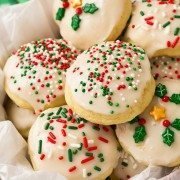 Simply put, they are so dreamy and you need to make them! 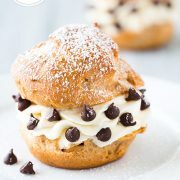 I’m already planning out the next time I get to make and indulge in these tempting treats again! I’m thinking Memorial Day or July 4th and probably, most definitely breakfast tomorrow. It just seems right. I’ll just add extra fruit to feel better about things :). Make them soon, everyone will love these! 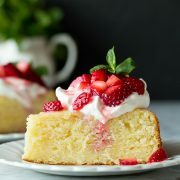 A elegant yet easy to make dessert! 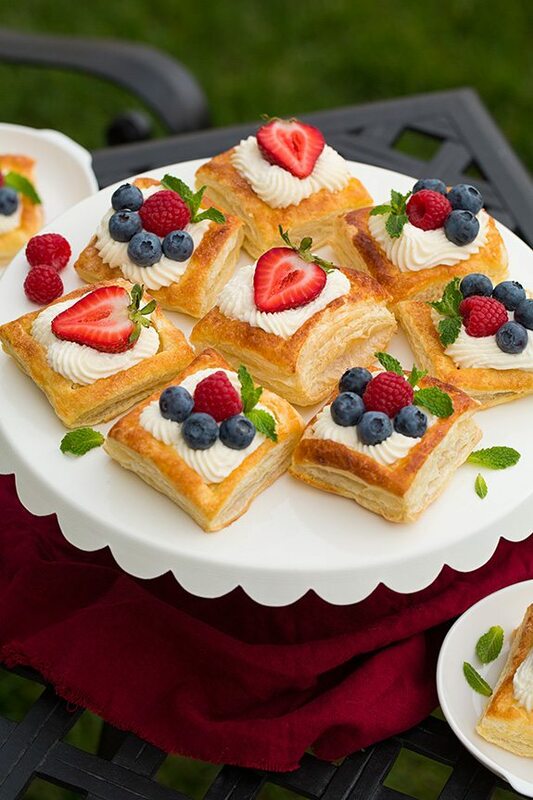 Store-bought puff pastry is cut and baked then filled with a simple ricotta cream filling and topped with fresh fruit. They're crisp and flaky and everyone will love that sweet, rich, fluffy filling! For the filling: Whip heavy cream in a medium mixing bowl using an electric hand mixer set on high speed until soft peaks form. Add 1/4 cup of powdered sugar and whip until stiff peaks form, set aside. In a separate medium mixing bowl whip cream cheese until fluffy, about 1 minute on high speed. Add remaining 1/2 cup powdered sugar and vanilla and mix until combine. Add ricotta and whip until fluffy, about 1 minute longer. Fold in whipped cream mixture. Cover and chill through. 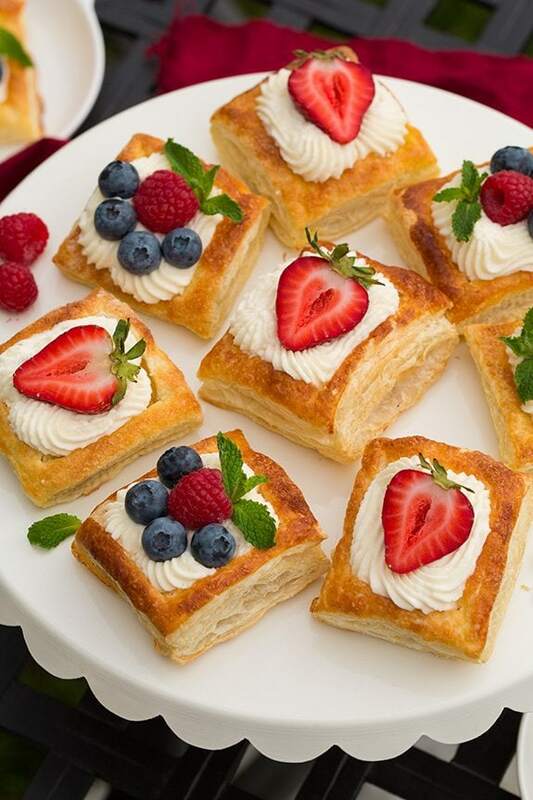 Keep chilled until ready to serve pastries (use within the day for best results). 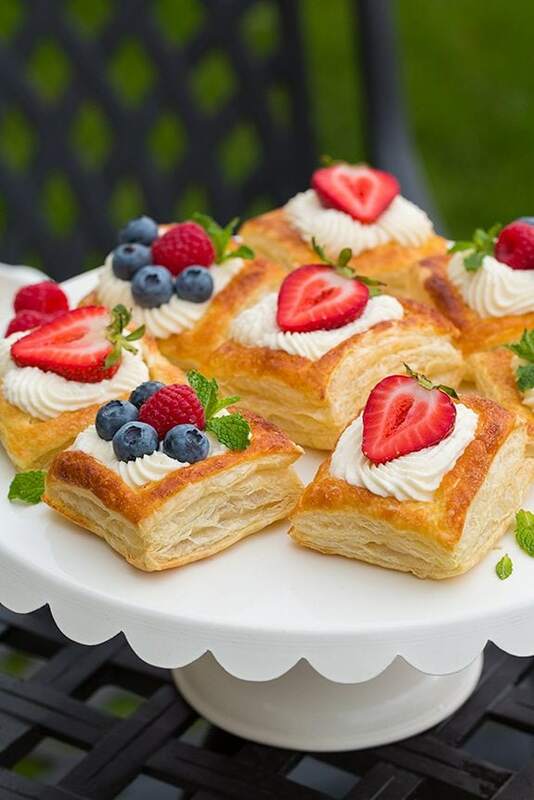 For the pastries: Thaw puff pastry about 20 - 30 minutes (it should still be cold, don't thaw entirely through it should hold a fairly stiff shape). Preheat oven to 400 degrees about halfway through thawing puff pastry. Unfold dough then cut each sheet into 9 squares (I used the folds as a guide cutting those into strips, then from there each strip the into thirds). 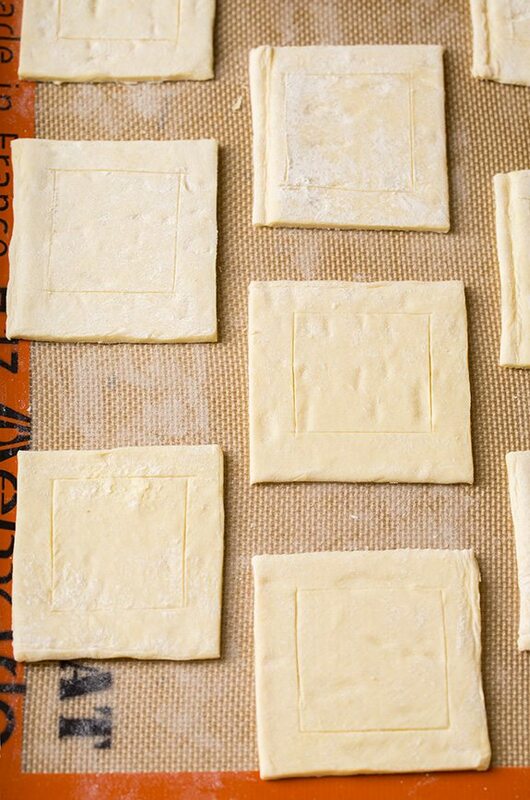 Without cutting all the way through the dough, cut a square inside of each pastry square, coming about 1/2-inch from the edge on all sides. Transfer pastries to two 18 by 13-inch baking sheets lined with silicone baking mats or parchment paper, spacing them at least 1 1/2-inches apart. Transfer one baking sheet of pastries to refrigerator to keep cold. Brush remaining sheet of puff pastries with egg mixture and sprinkle with sugar. Bake 10 - 15 minutes until well puffed and golden brown. 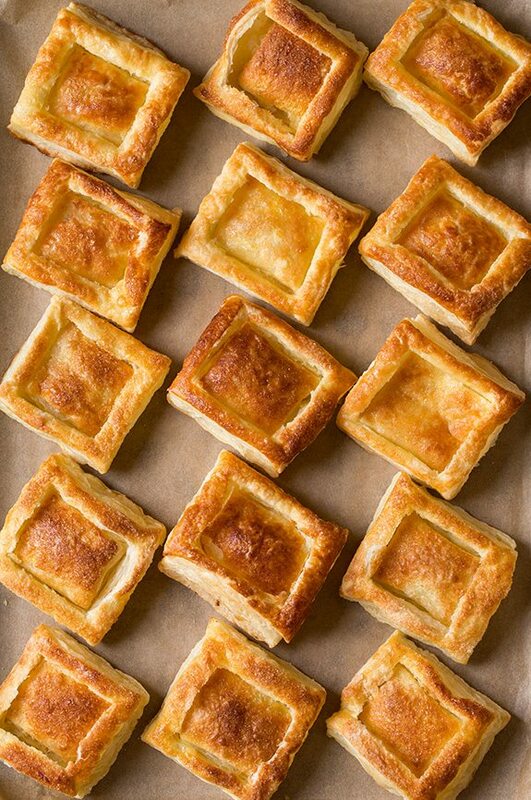 Remove from oven and immediately (and gently), follow square previously cut and cut once more using a sharp knife so the pastry will collapse in the center while it's still warm. Repeat process with second chilled sheet of pastries. Let pastries cool on a wire rack. To assemble pastries: Transfer filling to a piping bag fitted with a star or round tip. 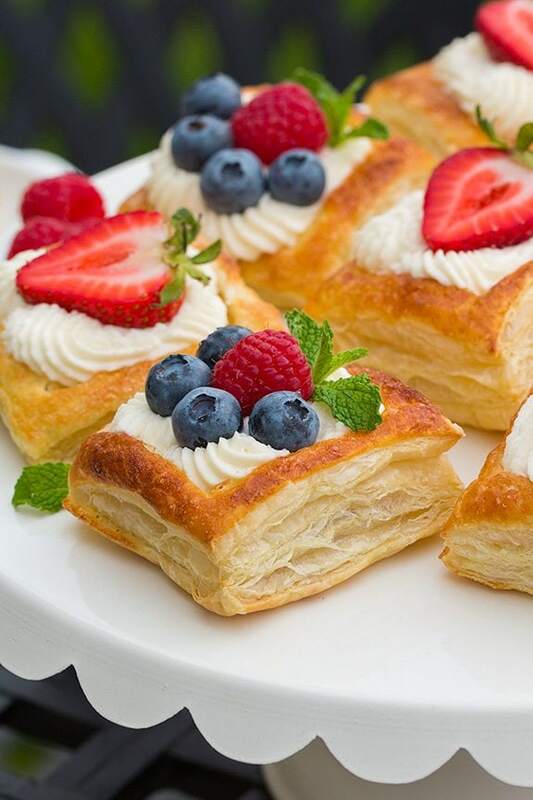 Pipe filling into puff pastry squares just before serving then top with fresh fruit and mint**. *I recommend Galbani, it has a nice rich, thick consistency and doesn't need to be strained much. To strain simply place it on several layers of paper towels then wrap and fatten and press to extract some of the excess liquid. You only need to get rid of about 1 oz of moisture from the Galbani. The ricotta should hold it's shape pretty well at this point. **Once filled they should stay crisp for about 2 hours, and they should be kept cold. Heghineh: Amazing very Detailed Photography!